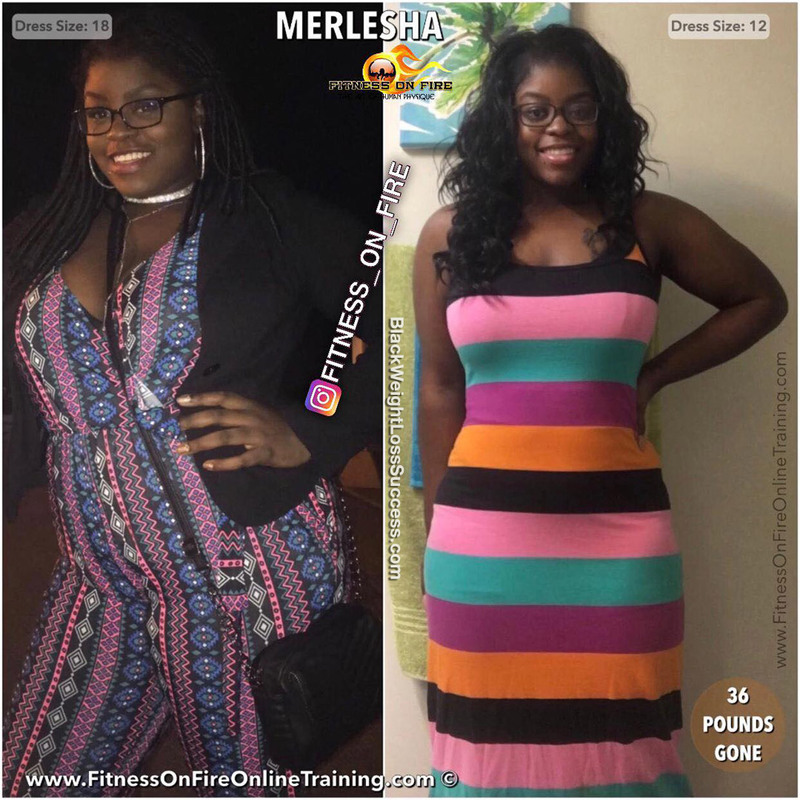 Transformation of the Day: Merlesha lost 36 pounds. She was surprised that she was able to release the weight by eating much more food… healthy, delicious food. With daily guidance from her nutritionist and an effective workout routine from her trainer, she has truly transformed. 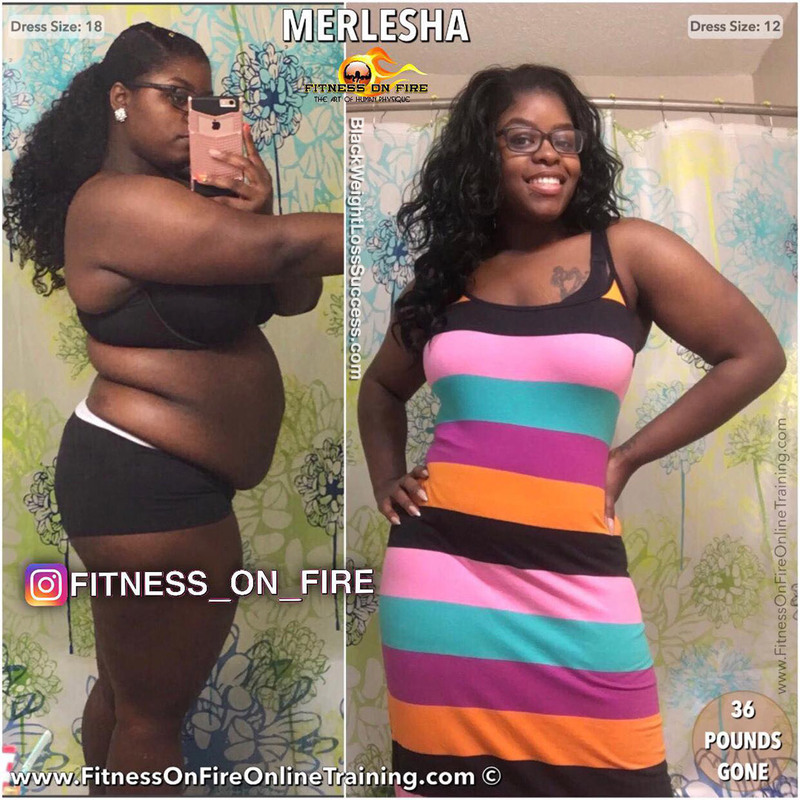 Check out her journey. What was your motivation? What inspired you to start your weight loss journey? I follow a lot of fitness pages on Instagram, and I saw a lot of weight loss stories that were inspiring. 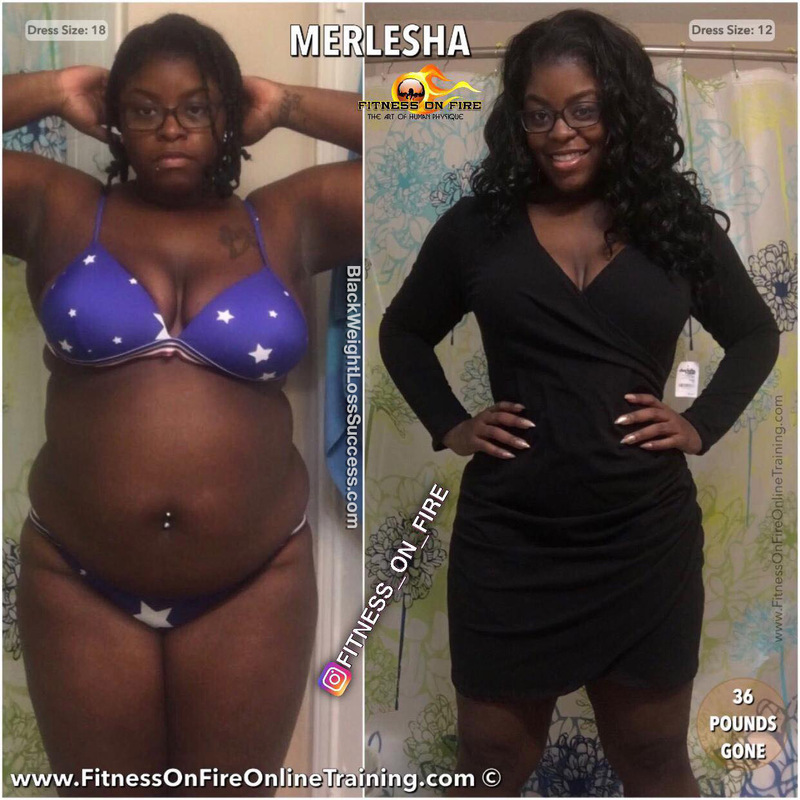 Then, I saw the posts from the Fitness on Fire Online Training Program‘s featured weight loss success stories (Rashonda, in particular). Everyone they featured had great results, and I saw a few women who had bodies similar to mine who dropped the weight. I had been unhappy with my appearance and my weight for a while, and that was my overall motivation. Right before I started the program, I was diagnosed pre-diabetic, so I had to get serious about my weight loss goals. I started eating structured meals that included balanced servings of protein, fiber, and vegetable or fruit. I also started to eat a lot more than I did previously. I used to eat probably 1 or 2 bad meals a day with some unhealthy snacks here and there. On the Fitness on Fire program, I eat 3 balanced meals and 3 healthy snacks each day. Adding food to my diet was surprising at first because I didn’t think I’d be able to lose weight while eating so much food each day. I cut out red meats and soda. I started only to consume chicken, turkey, fish for protein. I also just drank water. I added a lot more fruits and vegetables to my everyday diet and used portion control containers to make sure I wasn’t overeating. I switched out regular, high-fat cheeses for low-fat cheese. My workout consisted of 75 minutes of HIIT/Resistance Training, following the workout regimen that was given to me by my online trainer, King of the Fire. I went to the gym 3 days out of the week. My transformation took five months. At first, I didn’t think anything was happening until my jeans started to fit baggy. When I noticed the pants fitting differently, I compared some pictures I took at the beginning of my journey with more recent photographs and actually saw a difference! That motivated me to keep going. After a while, people around me who didn’t know I was on a weight loss journey started to comment about my weight loss. That let me know that I had to keep going! I think that Fitness on Fire worked over other programs that I tried because I had accountability. Having to send in pictures of what I ate and having to talk to the NutritionistGuru every day really helped me because I felt like I couldn’t mess up without getting in trouble, lol. The Fitness on Fire program also allowed me to eat all of my favorite foods. I still ate tacos, pizza, and pasta but they were just cleaner, healthier versions. This program had me eating all day, so I didn’t feel like I was deprived or starving throughout the day, as other diets and programs did. Staying consistent, understanding that change doesn’t happen overnight, and remembering my goals were the most important things to me during this journey. I’ve tried other things that could have possibly helped me lose weight, but after being on track for a while and not seeing results, I’d give up. During this journey, I had to make sure that I was consistent with my meals and workouts. I had to make sure that I told myself that even though I wasn’t seeing a difference right away, it didn’t mean that my body wasn’t in the process of transforming. Just keep pushing! How did you lose your stomach to get a flat one?